Need more information about booking Home 7280201 ? Marloth Park is a Nature Conservancy adjoining the Crocodile River and the Kruger National Park. There are no fences within the conservancy and it is recommended that you do not walk around after sunset as predators have been known to enter the conservancy from the adjoining Kruger National Park. 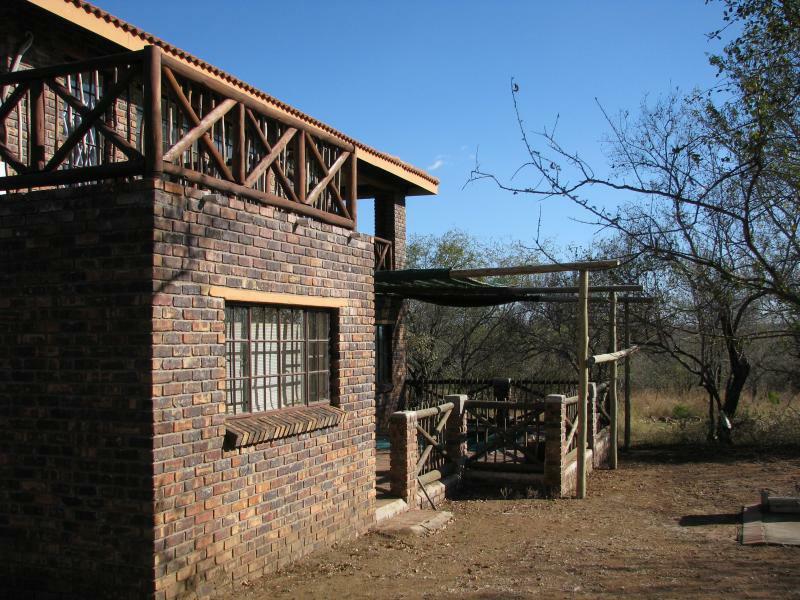 Peaceful Hide is a fully furnished self-catering house with electricity situated on the main tar road close to two water holes. The house sleeps 8 plus two children sharing in four bedrooms with two bathrooms (Water heated by electricity), built-in-cupboards and a secure upstairs braai (barbeque) patio. All rooms have fans. There is a separate braai (barbeque) for use downstairs by the dip pool. It is within easy walking distance from the Crocodile River overlooking the Kruger National Park. Features include: Secure braai /barbeque patio upstairs with a gas braai. Monitored alarm. Covered dip pool with safety net and outside braai (barbeque) area. Dartboard, darts and fingerboard are available. Star gazing is a must in this sparsely populated area. Below is a map of Marloth park as seen from Google Earth. Peaceful Hide can be seen on the left and to the west is the river. At the top (North-west) is a farm, and in the centre is Lionspruit game reserve. The dark line travelling North then east then south is the main tar road, Olifant str. Marloth Park is a beautiful area to cycle, especially along the sand roads next to the river. Peaceful Hide is within 20km of Crocodile bridge gate to the Kruger National Park. Access to Lion Spruit game farm is close by. The main upstairs bedroom has its own private balcony and an additional bed if needed. There is a DVD player and DSTV easy-view (not full DSTV) and some DVD titles. PLEASE DO NOT SMOKE IN THE HOUSE. USE THE ASHTRAYS PROVIDED, SMOKE ON THE VERANDA'S OR BY THE POOL AND THROW THE BUTTS IN THE OUTSIDE GARBBAGE BIN. MARLOTH PARK IS A MALARIA RISK AREA. CONSULT YOUR PHARMACIST. 1) no loud parties or noises at night. 2) All windows and doors must be closed when the house is empty or quiet. Baboons and monkeys will try to enter the house when there is no movement and the guest will be held responsible for any damages. 3) Some animals may appear tame but treat ALL animals as wild and dangerous.